Oftentimes in our entries about custom wallpaper we're discussing photographic imagery to be used as a wall mural, and the affect that the image will have on the wall mural's viewers. Consider taking a completely different direction and commission a wall mural that features text and font as art forms. American artist Edward Ruscha is well known for his work that utilizes text and font to give his unique commentary on American culture. By either creating his own stylized fonts or intermingling text with background imagery, Ruscha's work has been starting conversations about graphic design as an art form, and drawing parallels to Pop Art for decades. The custom wallpaper installation we're featuring in the inspiration room is comprised of a printer's block letters, haphazardly arranged . 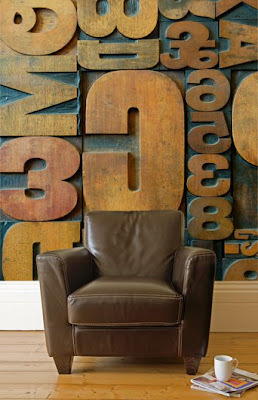 Real wood texture and depth give the wall mural an original look, and the stacks of numbers and letters, some in reverse, speaks to the complexity of human language and meaning, and font and text as tools to express that complexity. If you want to take a more literal approach to a font mural, your own prose or poetry would make a truly unique custom wallpaper installation. Or, use your own imagery along with text to pay homage to Ruscha's work.